An ecosystem can be defined as a diverse set of species and their habitat and interaction between them. Ecosystems are the basic functional unit in ecology. In other words, a community of living organisms and non-living organic components of that environment collectively form an ecosystem. These components interact with each other. British ecologist A. G. Tansley was the first person to coin the term ‘ecosystem’ in 1935, where ‘eco’ means environment and ‘system’ means a complex of coordinated units. Aquatic Ecosystem: – An aquatic ecosystem can be defined as one that exists in a water body. All the living organisms are dependent on each other and their surroundings for their survival. There are two subcategories of an aquatic ecosystem: – Marine ecosystem and Freshwater ecosystem. Terrestrial Ecosystem: – A terrestrial ecosystem is found only on landforms is known as the terrestrial ecosystem. The major difference between terrestrial and aquatic ecosystem is that they have a shortage of water compared to aquatic ecosystems. There are four main types of terrestrial ecosystem: – desert ecosystem, forest ecosystem, grassland ecosystem and mountain ecosystem. Approximately 8% of the world’s land is covered by rainforest ecosystems. These ecosystems contain around 40% of all the world’s plant and animal species. All ecosystems depend on natural cycles. There are four major cycles in an ecosystem: – water cycle, mineral cycle, energy cycle and community dynamics. Declan, Tobin. " 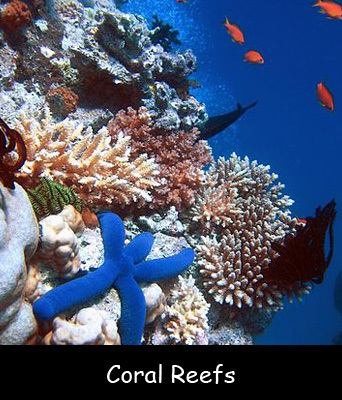 Ecosystems Classification Facts for Kids ." Easy Science for Kids, Apr 2019. Web. 25 Apr 2019. < https://easyscienceforkids.com/classification-of-ecosystems/ >.